David Samson, United Airlines, Port Authority: Chris Christie ally investigated over little-used flight. 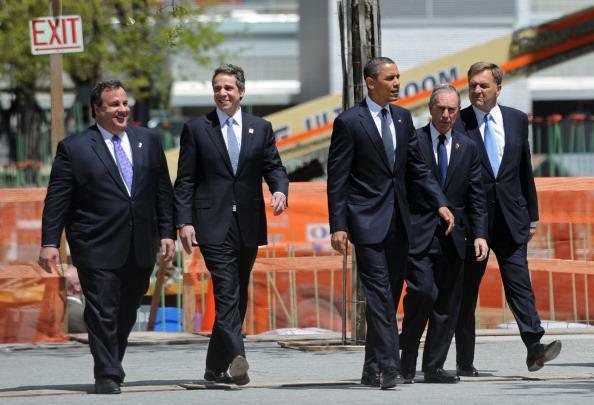 Samson, far right, with Christie, Andrew Cuomo, Barack “Barry” Obama, and Michael Bloomberg. David Samson is a New Jersey political figure who was counsel to Chris Christie’s 2009 election campaign and head of Christie’s gubernatorial transition team. After that he became the chairman of the Port Authority, which runs New York and New Jersey’s airports, bridges, tunnels, regular ports, and most disgusting bus station. Samson resigned in March 2014 under a proverbial cloud of intrigue, suspected of abetting the individuals who closed George Washington Bridge access lanes in 2013 for political reasons and of making official decisions that benefitted clients of his personal law firm. Northjersey.com is now reporting that Samson is also being investigated for his connection to an often-undersold United Airlines direct flight from Newark to Columbia, South Carolina—a route that terminated near a home where Samson spent weekends and which was eliminated by United three days after he resigned his chairmanship of the Port Authority. Samson referred to the twice-a-week route — with a flight leaving Newark on Thursday evenings and another returning on Monday mornings — as “the chairman’s flight,” one source said. Federal aviation records show that during the 19 months United offered the non-stop service, the 50-seat planes that flew the route were, on average, only about half full. United Airlines was in regular negotiations with the Port Authority and the Christie administration during Samson’s tenure over issues that included expansion of the airline’s service to Atlantic City and the extension of the PATH train to Newark Liberty.